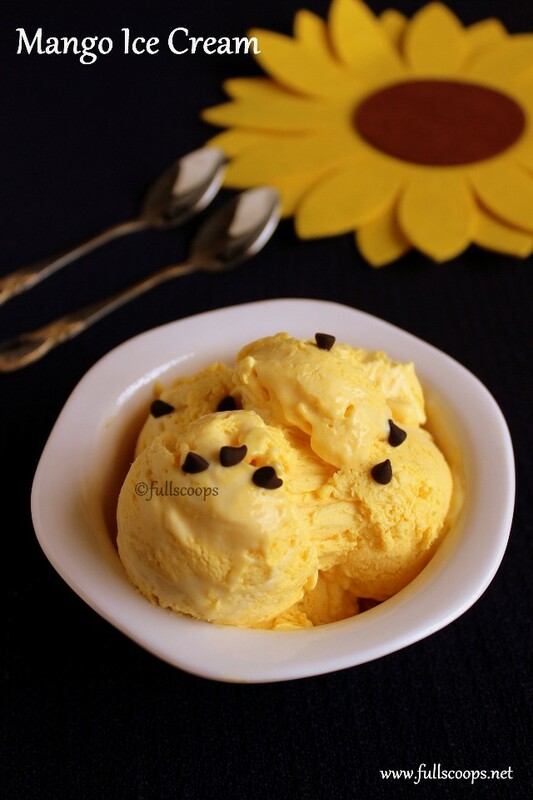 Mango Ice Cream ~ Full Scoops - A food blog with easy,simple & tasty recipes! I have already posted a Mango Ice Cream recipe earlier that I made using milk, we loved that ice cream recipe too. 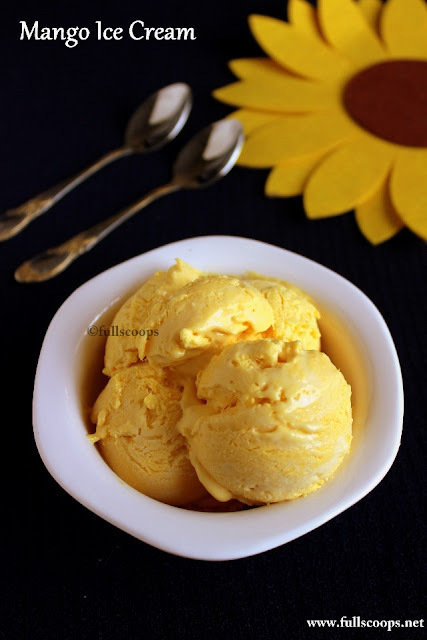 This summer I wanted to make some Mango Ice Cream using cream and this also turned out really well, so creamy and rich! I made this ice cream for my driver's family and I'm told they enjoyed it thoroughly! Check out the other mango recipes also. 1. Add chopped mangoes to a blender and blend well to get 2 cups of mango puree. Set aside. 2. Take the cream in a steel bowl. Add the vanilla extract and beat until semi stiff peaks are formed about 5-6 mins. 3. Add the fresh cream and beat again for a couple of minutes. 4. Add the mango pulp and beat again. 6. Pour into air tight container and freeze for 6-8 hours. 1. The amount of condensed milk added depends on the sweetness of the mangoes. 2. Use ripe fibrous mangoes and not stringy ones. 3. You can add some chopped toasted nuts or chocolate chips to the batter. Or you can even add about a cup of chopped mangoes. 4. I have used non dairy whipping cream as that's what I get here, if you get dairy whipping cream, use 2 cups of it and add about a tin of condensed milk (adjust sweetness to taste). Hi Beulah, I have followed the recipe, I used Amul cream but that didn't whip up to stiff consistency. Though I completed all the process and now the mixture is in the freezer. Very nervous as I am looking for a creamy ice cream. Will the not stiff consistency be a problem??? 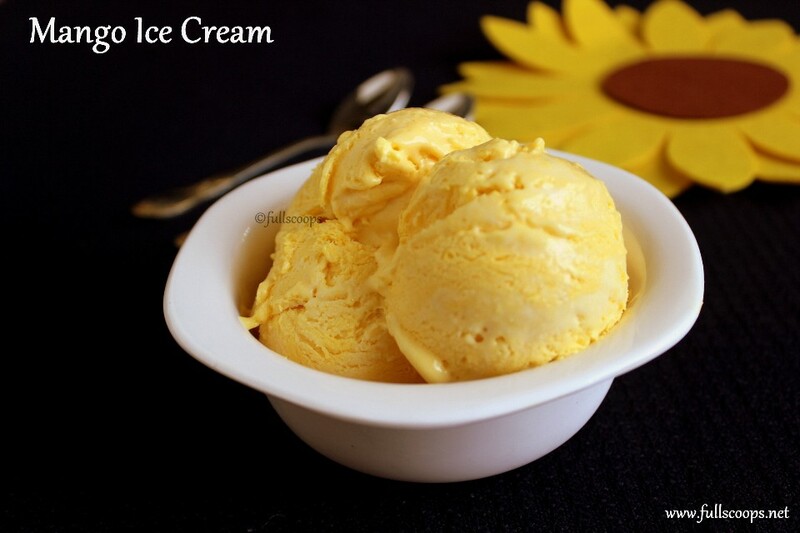 Amul cream will not whip up, you need to use a heavy cream for a rich and creamy ice cream. Nevertheless, it will be good, don't worry. 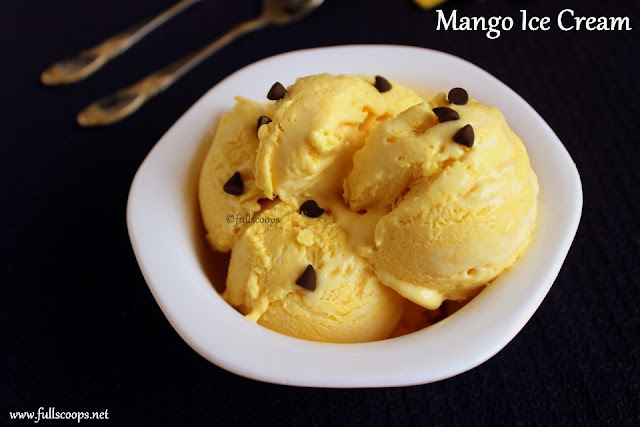 Delicious and creamy mango ice cream.. looks yummy..
Looks so delicious. Tempted to try. Is there any alternative to condensed milk, Beulah? Use 1/2 cup of icing sugar, increase or decrease depending on the sweetness of the mangoes. Hi.. I just followed your recipe.. but made a mistake, I mixed in all of the mango pulp when the whipping cream formed soft peaks.. and then continued to beat for another minute. I was afraid, if I continue to beat it further, the cream would form butter, as from my previous experience of whipping cream. Would the ice cream turn out well, with the soft peak whipped cream or should I beat it further? How much more? Hi, don't worry it will turn out well. Whipping the cream longer will give you a creamier ice cream. Nevertheless, this will be good!